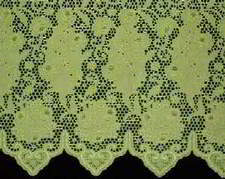 Schiffli embroidery is produced by machines with several hundred needles placed horizontally one above the other. 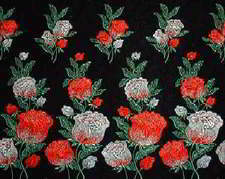 Schiffli Embroidery is manufactured by applying machine embroidering with front yarn and back yarn on base cloth using the Schiffli Embroidery machine, which is 18 meters in length and equipped with 1,000 needles. The features that differentiate embroidery from other kinds of lace are its freedom of design and ability to create luxurious three-dimensional effects. The stitching is performed on the fabric. The fabric remains on the final product. The water-soluble fabric is lapped over the net, on which the stitching is performed. Later the water-soluble fabric is dissolved allowing the embroidered stitching and the net to remain. 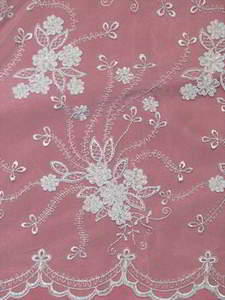 The fabric is perforated by a special device called g-borers on the machine in addition to being stitched by needles. The stitching is performed on the water-soluble fabric which is dissolved afterward, allowing only the embroidered yarn to remain on the final product, thus laces of many styles can be duplicated on the embroidery machine. Multi-color embroidery produced by a special type of machine called gColor Change Machineh, which enables the needles of different colors to work in turn.